Size Male to 8 " (20cm) Head and Body 4 1/2 " (12 cm) TailWeight: 150-300g. DescriptionSimilar to Rat but smaller with a blunt snout and tiny ears,also known as the Water Rat. 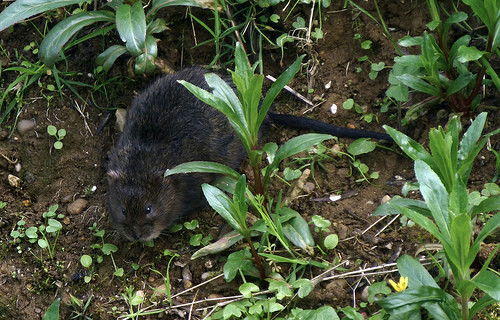 This vole feeds mainly on water plants and lives in bank side burrows. It is less common in uplands. The ears of the water vole are barely visible, unlike the rat which stand out. The water Vole tail is furry whilst that of the rat is bare. 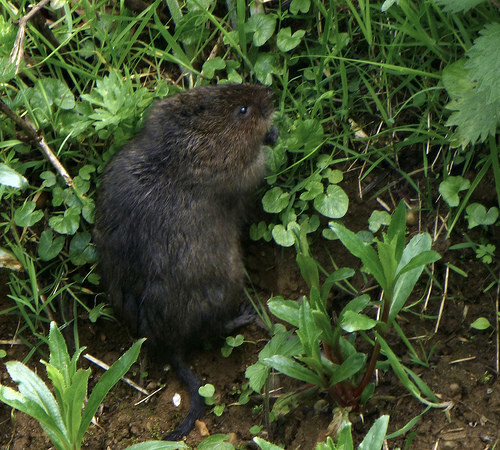 The muzzle of the water vole is blunt, not pointed as in the rat , its fur is more red and the tail is shorter. HabitatWater voles occur along well vegetated banks of slow flowing rivers, ditches, dykes and lakes. Water voles excavate burrow systems into the banks of waterways. These have sleeping/nest chambers at various levels in the steepest parts of the bank usually with underwater entrances to give the animals a secure route for escape if danger threatens. Tell tale signs include "Lawns" of closely cropped grass, occasionally with piles of chopped vegatation may be found near entrances to burrow . Water voles tend to be active more during the day than at night. Male voles live along about 130 metres of water bank, while females have ranges about 70 metres long. They deposit distinctive black, shiny faeces in latrines. Latrines occur throughout and at the edges of their range during the breeding season. DietThey eat grasses and waterside vegetation: over 200 plant species have been identified in their diet, though other broadleaved plants may also be eaten at certain times. Water voles usually have three or four litters a year, depending on the weather. In mild springs the first of these can be born in March or April, though cold conditions can delay breeding until May or even June. There are about five young in a litter, which are born below ground in a nest made from suitable vegetation, notably grasses and rushes. Although blind and hairless at birth, young water voles grow quickly, and are weaned at 14 days. Average Lifespan of water voles is aprox 5 months in the wild. Main predators are mink and stoats; though herons, barn owls, brown rats and pike will prey.